4. Lonicera L., Sp. Pl. 173. 1753. Gen. A. ed. 5:80.1754; Brandit, For. Fl. N.W. & C. Ind. (repr. ed.) 254.1874; C.B. Clarke in Hook. f., Fl. Brit. Ind. 3:9.1880; Rehder, A. Rep. Missouri Bot. Gard. 1903:27-232; Parker, For. Fl. Punj. (repr. ed.) 269.1956; Wendelbo in Rech. f., Fl. Iran. 10:4.1965. Deciduous or evergreen shrubs, erect or prostrate (some exotic species twining). Winter buds with scales. Leaves petiolate or sessile, entire (lobed or connate at the base in non indigenous species). Flowers in axillary pairs or terminal capitate heads, peduncled or senile, often connate by their ovaries, bracteate and 2-bracteolate; bracteoles distinct or connate or sometimes absent. Calyx tube ovoid, limb 5-toothed or cup-shaped, deciduous or persistent. Corolla tubular, gibbous or not at the base; limb subequally 5-lobed or 2-lipped, the upper Up erect, 4-toothed, lower reflexed, entire. Stamens 5, inserted on the corolla tube, anthers usually exserted. Ovary 2-3-locular, style long filiform, stigma capitate, usually exserted. Fruit a berry; berries distinct or connate in pairs. A genus of more than 200 species distributed in temperate and subalpine regions of the Northern Hemisphere. 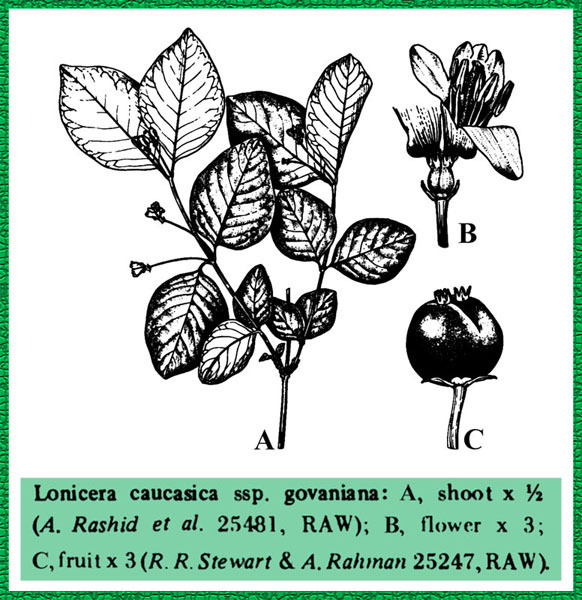 About 18 species are indigenous to Pakistan; 2 species are cultivated in gardens. 2 (1) Rants erect 18 Lonicera sp.